SEOUL, South Korea (AP) — The broadly smiling North and South Korean leaders embrace each other as cheering Pyongyang residents wave fake flowers. The two inspect goose-stepping soldiers and ride together in a convertible Mercedes limousine for a parade. The leaders praise one another for taking the initiative to open a new era of inter-Korean detente. These striking images were captured Tuesday after South Korean President Moon Jae-in arrived in Pyongyang during closely watched talks with North Korean leader Kim Jong Un about the fate of Kim’s nuclear arsenal. 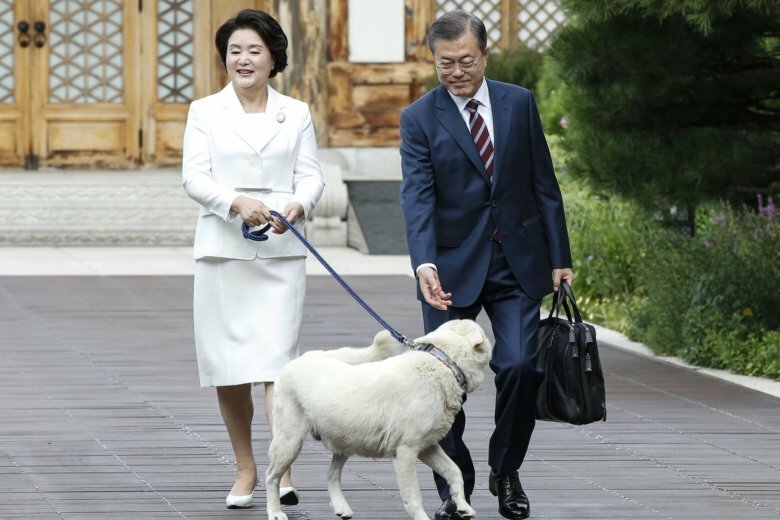 When Moon left his hillside presidential palace in Seoul on Tuesday morning, his dog Maru, a white Korean Pungsan, joined presidential officials to see him off. Photos showed Moon walking with Maru as his wife, Kim Jung-sook, held the dog’s blue leash. The couple then took a helicopter to a military airport near Seoul to fly to Pyongyang. Moon, a pet lover, has also adopted a shelter dog named Tory, a mixed breed, to raise public awareness of the problem of animal abandonment. He also has a cat called Jjing-jjing. Upon Moon’s arrival at Pyongyang’s international airport, he was greeted by thousands of neatly dressed Pyongyang residents who chanted orchestrated rapturous slogans like “national unification” while waving pink and red plastic flowers and North Korean and unification flags. A smiling Kim, dressed in his trademark dark Mao suit, waited at the airport tarmac with his young wife, Ri Sol Ju, before they exchanged warm handshakes and hugs with the Moons. The two leaders later inspected a goose-stepping North Korean honor guard carrying bayonet-tipped rifles. A military band played rousing ceremonial music used for the highest-level state events. Kim’s powerful younger sister and propaganda chief Kim Yo Jong moved around the site, checking to see if things were going smoothly. Before Moon left the airfield, he deeply bowed and approached to exchange handshakes with some of the cheering crowd who were bouncing with excitement. On the way to Moon’s guest house, the two got out of their respective cars at one point and walked together a bit while waving to residents gathered along perfectly manicured Pyongyang streets. They later got in a black open-top Mercedes limousine together. When their limousine drove a few kilometers (miles), South Korean media pool footage showed that the convoy of black vehicles and motorcycles were the only ones on the route, which was lined with artificial flower-waving residents, mostly women wearing colorful Korean traditional hanbok dresses. When they got out of the limousine at the guest house, they both fixed their hair. An estimated 100,000 North Korean residents were gathered for the parade. When Moon’s friend and liberal predecessor Roh Moo-hyun visited Pyongyang in 2007 for a summit with Kim’s late father Kim Jong Il, he held a similar parade with Kim Yong Nam, the North’s nominal head of state. Another liberal South Korean president, Kim Dae-jung, rode together in a limousine and held about a half-hour of talks with Kim Jong Il on the first day of a visit in 2000. He reportedly turned down an offer to be in an open-topped car for security reasons. Standing with their wives, the two smiled broadly and exchanged warm words. Kim said he had felt sorry in May because he thought he didn’t give Moon sufficient hospitality during their second summit at the North Korean side of the Panmunjom border village. Moon said his “heart was full” when he saw Pyongyang residents welcoming him. Later at the start of their summit, Kim said he feels closer to Moon because of his “tireless efforts” to help improve the North’s ties with South Korea and the United States. Moon responded by thanking Kim for making a “bold decision” to attend February’s Winter Olympics in South Korea, which was the start of ongoing inter-Korean rapprochement.